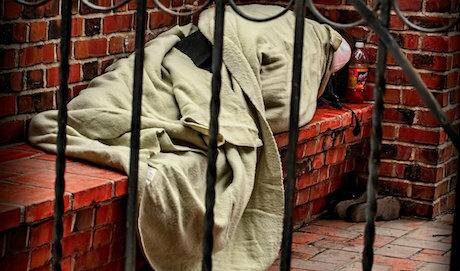 Figures show that homelessness has been increasing year on year since 2010. Lack of legal aid is a lesser known contributory factor. Photo credit: Pixabay/bluesbby. Some rights reserved/CC0. Legal aid is the neglected arm of the welfare state. At Shelter, we depend on legal aid to advise and represent people facing court actions for possession of their homes or who are homeless but cannot get assistance from their local authority. But as a result of the cuts to legal aid made by The Legal Aid, Sentencing and Punishment of Offenders Act 2013 (‘LASPO’) there are now many housing problems we cannot help with. These changes have led to an increasingly crisis-driven approach to funding housing advice. As a result of LASPO, legal aid is no longer available for the preventative work that can stop a problem becoming a crisis. An obvious example is the removal of legal aid for welfare benefits, which leaves people to fall through the net until it is too late to rescue their situation. This is despite the fact that such problems are often complex and caused by failing administrative processes, and that they are by their nature likely to affect the most vulnerable people in society. This problem occurs in its starkest form in cases where people have fallen into rent arrears because they have not received their full housing benefit or universal credit entitlement. Where the landlord takes possession action against tenants on the ground of rent arrears, we are often able to obtain an adjournment of the first hearing to buy time to investigate what has gone wrong with the client’s benefits claim. But legal aid is no longer available to fund this work – even though the fact that the tenant is not receiving their benefits entitlement is at the heart of the case. It will be of no avail if by the time of the next hearing there has been no progress in securing payment of benefit and a reduction in rent arrears. Where people cannot resolve their benefits problems without assistance, the court will have little alternative but to evict. People may and do become homeless needlessly and unjustifiably, all for the lack of assistance in obtaining the housing benefit which is rightfully due to them. It is ironic that the Homelessness Reduction Act, which came into force in April last year, places great emphasis on the prevention and relief of homelessness. Yet, when work needs to be done to resolve a person’s benefit problems or other housing issues, there is often no one to do it because of the lack of legal aid. Superficially, LASPO may have produced savings in the legal aid budget, but in reality, the effect has been to impose disproportionately greater costs on the justice system and on other public services. When a family are evicted who, with timely legal assistance, could have saved their home, or where people are compelled to continue living in unfit accommodation, this has the effect of imposing further costs on the courts, social services, educational authorities and the National Health Service. Quite apart from the human misery caused to families and individuals, the knock-on effects of homelessness and poor housing conditions will be felt by the state, possibly for years to come. If advice is to have the best chance of preventing homelessness, it needs to be early enough to make a difference, and it must be holistic in addressing all the elements of a person’s situation – for example, one person’s case may involve elements of relationship breakdown, joint tenancy, housing benefit, rent arrears, homelessness and priority for social housing. Virtually any tenancy problem will ultimately lead to a breakdown of the landlord and tenant relationship and often to eviction if it is not dealt with at an early stage. There is no point in waiting until there is a threat of eviction and imminent homelessness, which is how LASPO currently works. There is a compelling need to bring early advice on housing and welfare benefit problems back within the scope of legal aid. This article was originally published by the Bar Council as part of their Justice Papers series. To hear the voices of those impacted by the legal aid cuts, see here: https://opendemocracy.net/openjustice/voicesforjustice.